The Clay County African American Legacy Inc. (CCAAL Inc.) was founded in 2000 during the Kansas City 150th annual "Celebration of the Heart.” The primary focus of the organization is improving the quality of life for its citizens by educating adults, and especially youth, of the cultural diversity that exists in the Northland. 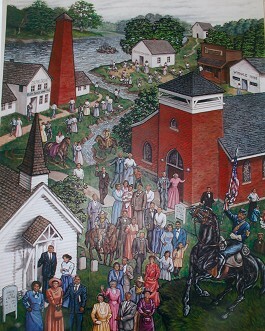 In 2001, CCAAL Inc. raised funds to build a Freedom Fountain Monument in Liberty, Missouri, on the lawn of the old courthouse square, and in 2002 installed an a 8 x 10 ft. mural on the 3rd floor of the Administration Building, featuring African American pioneers businesses, schools and churches from the 1820’s to the present day. CCAAL Inc. purchased Garrison School, established in 1877 to educate black youth of Liberty, from the Liberty School District in 2003. This permanent base of operation allows the organization to present ongoing programming for residents of Clay County and the Greater Kansas City metroplex.